I was recently asked why I don’t buy paper towels. My friends think it’s strange – so I thought I’d write about it! I stopped purchasing paper towels 3 years ago, not on purpose – but because I only had so much money in my grocery budget. Something on the list had to go! I was a new stay at home mom, and to make it work on one income we had to lower our grocery budget (among other things). It was interesting that after only a couple days I stopped noticing that they were missing. Even my husband and kids stopped asking where they were. It was an easy switch…we just used kitchen towels. The whole thing got me thinking about what else I could cut out of my grocery budget without anyone really noticing. I figured that with the above changes, I was saving around $6.00 – $7.00 per week (depending on sales. Admittedly this wasn’t a lot but at $30.00 per month and $363.00 per year it becomes a more impressive number! I was pretty excited, so I started looking for even more ways to save. I considered using cloth napkins in place of paper, but with so many kids – I would be doing a lot more laundry washing cloth napkins…it’s not a good tradeoff for me. Maybe once the kids are a bit older! The next thing to go was my Swiffer. Now, I realize this seems a bit extreme, especially with a house full of kids and pets – BUT hear me out! I have a ceramic tile floor in my kitchen (which is directly off the front door). It’s white and gets very dirty – very quickly. The Swiffer was great for spot cleaning, but it never got in between the tiles where food and everything else would stick. It also didn’t do a very good job scrubbing the corners. I found that more often than not, I was getting out the bucket and rags to scrub it myself. So why buy special cloths and cleaners? When I cut out the Swiffer expense – I saved our family another $20.00 – $25.00 per month (I used the Swiffer wet jet and had to buy the cloths and the floor cleaner). That’s $240.00 – $300.00 per year! My combined savings saw a $50.00 (and $663.00 per year) reduction per month in my grocery budget. Not a huge number…but a great start! This began my quest to eliminate everything in my grocery/household budget that wasn’t an absolute necessity. Cooking foods from scratch seemed to be the key – but that’s another story! What about you? What, if anything, have you eliminated from your grocery budget to save money? 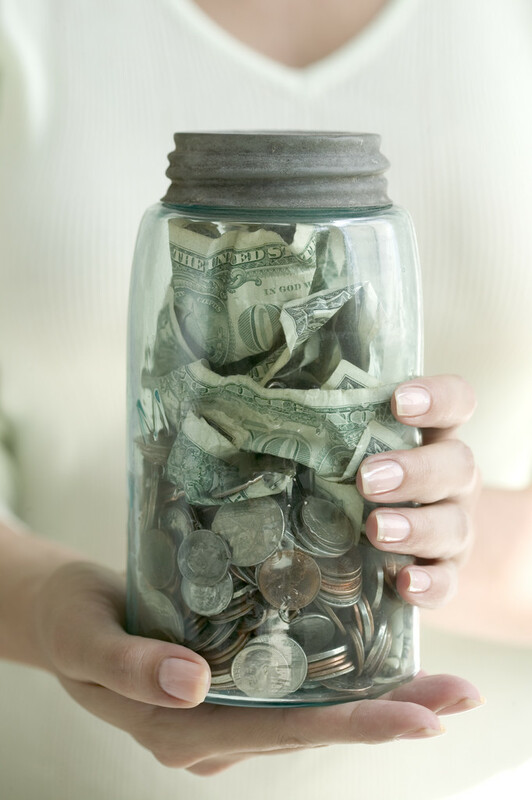 I’d love to hear from you – money saving tips are much appreciated! My German Mama (grew up in the awful depression there, post WW1) cut down on cloth-napkin laundry by getting us all our own unique, identifiable napkin ring to hold our napkins, which we folded nicely, tucked in our rings, and re-used. We were prissy girls, she only had to wash them once a week. I’ve adopted the same trick (but wash whenever they start to look un-fresh, usually twice weekly). We still use paper for really messy finger foods, like barbecue ribs, or Buffalo chicken wings. That’s a great idea! I really want to get rid of the paper napkins – I guess I’m just worried how it will go over! My own grandmother grew up here in America during the depression and she always thought it was crazy to have all that “paper stuff”! We use cloth napkins (made them myself), and we keep a large supply of 6×6″ wipes around for wiping faces, spills, whatever else needs cleaned. I have a swiffer, but I use washcloths on it. I use vinegar/water for a lot of my cleaning. I make my own laundry detergent. Before I cut out paper towels I thought I’d never be able to live without them, and now I hardly notice them. I also cut out squash/diluting juice and save a fair bit; I used to just drink it because I knew it was there. Water is way healthier also! It’s amazing what a person can do without! We gave up mixed drinks for the kids…tea mix, kool-aid, pop etc – first for the health and second for the cost. Now if we want something else besides water – we make it. Much better! Cutting out paper towels does seem like a great idea, especially since I am a compulsive hand washer when I cook. I buy the dish towel cloths from Trader Joes and they work well for dishes and cleaning countertops, etc and they are washable! I love saving money and not throwing away the paper and you have given me the idea to try and start using those in place of paper towels and washing them weekly. I think they are about $2.99 or $3.99 for a pack of two but they are durable and last for months, if not longer, in my kitchen. I love that those are washable! I haven’t tried them, but will have to now! Thanks for the tip! Those are great ideas! We stay clear of cereal too – much to expensive and horrible for you! I try make regular “old-fashioned” breakfasts…toast, eggs, pancakes, waffles etc. It’s much cheaper too! By the way, what’s a Swiffer?! We try very hard to do that around here also – we have used milk jugs, coffee containers, egg cartons…you name it to start seeds in – I’m trying to show my children that there is more to it than just recycling. It’s alot of fun to watch them get creative! I don’t buy paper towels either! I stopped over a year ago, and my husband and I also found the switch super easy. We stopped for eco/green reasons; but the money saved is incredible. I agree – it’s probably one of the easiest switches! And teaching my kids to use less disposable is something very important to me. My wife only has paper towels for the holidays. She never bought a Swiffer but uses a mop for the floor which gets every where and in the corners. Shops for certain items in the local CVS and Publix for other items not in CVS. As far as Costco, she gets the large cans of sauce for what she pays for a small can of sauce in Publix. Go shopping with a friend who has a Costco card and make a list of the items you really need and only get those. Give a few bucks to your friend for the convenience. Pay them in cash for what you owe and save the ATM fees. Thank you for all the great tips! I also purchase my tomatoes for sauce at our local Sams Club – the price difference is amazing! In addition to all of the things you got rid of, I asked for several Christmas/birthday presents (which ended in big savings in the long run): two nice water bottles and a brita-type water filter, two quality travel coffee mugs, nice tupperware and a set of jars, a costco membership, and a small deep freeze. Great idea – it’s a great way to invest in things needed! Rag Bag… for messes, and simple bandanas suffice very nicely as large napkins, they are usually $1 or so. This is great 🙂 I don’t often use paper towels – only for those times where I’m really not sure if the mess would come out of a cloth! Paper/plastic plates and cutlery isn’t something I’ve used in a long time (if ever since living on my own) and I thank my parents for that habit – besides Christmas, they barely ever used them! Thanks! I think it’s interesting how many people don’t use disposable paper items! It’s a great money saver to avoid them! I used to buy garbage bags earlier but now I use polythene bags which I get from shopping! So agree with you about paper towels! 🙂 It’s amazing how the little things add up to save money! Me either, I find myself trying to eliminate anything that’s not absolutely necessary. With 5 kids, we never know when our budget is gonna take a “hit” so I try to keep things in check. I love re-using leftovers…the best dishes are created that way! The best tip ever for a sparkling bathroom: always finish with a dry cloth (microfiber is great). I read it somewhere that that’s how they do it in hotels. No more chalky water stains+ when you are in a hurry you can do only a quick dry erase and ready! LOVE THIS TIP! I actually used it this morning – we get alot of water spots with so many people in and out of my house! Did I mention I love this tip?! Thanks! I enjoyed your blog. I have eliminated many things, but I did it learning to do my own cleaners, creams, toothpaste, deodorant … and other stuff. I also found that just by using Dr. Bronners soap I replaced all other cleaners since this natural soap has more than 18 uses – cleaner, shampoo, laundry, toothpaste … the best thing is that it is supposed to be diluted depending on the type of job you need to do, so you get your money’s worth. Eventually, I want to learn to do my own soap by using the soapworth plant, which I need to grow first. I even do my own perfume using extracts from flowers that I like. I find that this lifestyle grounds me and I control what ingredients go into my body. The only thing is that it takes a bit of time to learn and make your own. It is easier these days with so many websites and videos available in Youtube or how to webstite. Many times, most of the ingredients are already in your pantry. Thank you! I am very interested in making my own cleaners – something on my list of things I need to do…but I really think it’s going to be worth it on so many levels! Growing up, my mom always used old dish cloths or even torn up sheets as dust rags, rather than using paper towels. I admit I use more paper towels than I should (with no laundry in my apartment it’s sort of worth it to me), but I did inherit my mom’s savvy by using a broom and dustpan and brush rather than a swiffer, works just as good! Don’t look yet, I haven’t written the post yet, but I am nominating you for the One Lovely blog award. Very helpful site. Congratulations, and thanks for encouraging me along the way! You are welcome. I’ve been enjoying your blog. I think these are great ideas! We have plenty of rags that we got from some volunteers last year. Seriously, I did laundry for two days that was just towels and washrags… but now I know what I can do with all those washrags! For me it’s bread! I don’t mean that I’m going gluten-free, I actually make all our bread now (even with a full-time job). It’s generally cheaper, and by buying flour in bulk with a friend it becomes WAY cheaper. I just mix up the dough in the evening while I make dinner & leave it in the fridge to rise until i have a night or a weekend to stick it in the oven… But my favorite is bagels, a little more work, but I can’t even eat store-bought bagels anymore, they’re so much yummier fresh from my own oven. I try to make ours too – it’s so much better for you, tastes better and costs less! We do bagels too – my children are really into making their own toppings for the bagels! When we had twins, money was really tight and we were doing laundry all the time anyway, so we use cloth towels and diagrams vs. paper. Bust some of the best cost savings for us has been cutting out cable TV and the Internet. Most everything Internet wise we do at Tye library on their free wifi or at Starbucks if I have to collaborate with someone. I know some people who pay $200 or more on those things. And it’s nice being able to unPlug when we get home! Gah! Auto correct, downside to using small keys if iPhone, lol. We use cloth towels and dishrags vs. paper and internet at the library. By checking out videos there, we also save on video subscription svs like Hulu or Netflix. We save over $2,400 a year doing these things. 🙂 Us too! We use netflix and hulu too! The savings is huge! We are actually getting rid of ours this month! We are pretty excited about the savings and also about all the extra time we are going to have! My husband and I have two cats, and anyone who owns cats knows that litter is incredibly expensive. We traded out our clay-based litter about a year ago, originally just for the health of our cats, for a corn-based product called “World’s Best Cat Litter.” It was a little more expensive, but when we discovered we could get the exact same thing from crumbled chicken feed, we ran down to the local tractor supply store for a bag of that instead, and we haven’t switched back since. Not only is it cheaper by leaps and bounds than regular cat litter, it lasts longer (a whole month if you “scoop” regularly! ), smells better, is bio-degradable, and is healthier. 🙂 I think we all need to play a part in helping out – and teaching our children is step 1…Thank you again for all your kind words – it really is nice to know people are reading and responding positively!